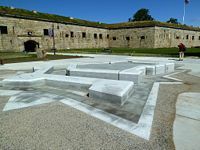 Fort Adams (1793-1946) - The current Fort Adams is a large Third System fort built on the site of earlier fortifications on the northern end of Aquidneck Island, Newport County, Rhode Island. Fort Adams was named for President John Adams and opened on 4 Jul 1799 as a First System Fort. Abandoned by the U.S. Army and turned over to the U.S. Navy in 1950. Turned over by the Navy in 1965 to the State of Rhode Island. From the original construction through the World War II era Fort Adams adapted to defensive needs of the times. The original defensive structures included the main seacoast fort itself, a significant Landside Outer Defense and beyond that, an Advanced Redoubt designed to protect the main fort from land attacks. The U.S. Civil War saw the main fort modified for newer, more powerful weapons. As shipborne and coastal defense weaponry further evolved the old fort and the land side defenses were abandoned as defenses and high powered gun batteries were placed outside the old fort in concrete batteries. These separate batteries remained the mainstay of the defenses up until World War II when aircraft and long-range naval weapons obsoleted them. During World War II the fort provided small caliber harbor and anti-aircraft defenses along with harbor mining. After the end of World War II, the whole concept of fixed harbor defenses was abandoned and the fort was no longer required. Rebuilt as a First System Fort in 1798 with 17 guns by Major Louis Tousard and opened on 4 Jul 1799. The first commanding officer of Fort Adams was Captain John Henry of the 2nd U.S. Regiment of Artillerists and Engineers. From 1 Apr 1802 to Jul 1814 the fort was unmanned. The War of 1812 made it necessary to garrison with three companies of Rhode Island militia who were released from duty Feb 1815. After the war, the fort was usually garrisoned by a company of regular artillerymen and operated as a sub-post of Fort Wolcott until 1821 when the garrison was removed. The current structure was built as a Third System Fort beginning in 1824 under the supervision of Lieutenant Andrew Talcott and, starting 22 Feb 1825, Lieutenant Colonel Joseph G. Totten, it took over 30 years to complete. Throughout Totten's tenure as superintendent of construction, he was assisted by a number of lieutenants in the engineer corps who had recently graduated from West Point. These included John G. Barnard, who commanded the defenses of Washington during the U.S. Civil War, George W. Cullum and P.G.T. Beauregard who would become a general in the Confederate Army and commanded the attack on Fort Sumter at the beginning of the U.S. Civil War. All three became Superintendents of the United States Military Academy at West Point. The Outer Redoubt was built in 1825. 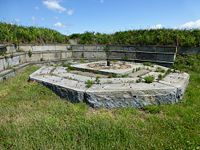 The Fort is a massive work with structural walls constructed of local shale and Maine granite. Alexander McGregor, a Scots mason and Newport resident, oversaw the stonework, which is still relatively intact. Features of Fort Adams that are uncommon or unique in United States military architecture include galleries under the ditches, counterscarp galleries, underground listening galleries tunneled under the glacis, and extensive outer defenses including the redoubt and tenailles, massive earth-filled, masonry cribs designed to protect the outer face of the fort's crown work from battering by a besieger's artillery. Fort Adams was mostly complete by 25 Aug 1841 when it was garrisoned by two companies (F and I) of the 2nd U.S. Artillery Regiment. In April of 1847, Fort Adams was designated a "rendezvous and receiving depot for all troops raised in the Eastern States". In reality, the fort was used in this capacity only by the 9th U.S. Infantry Regiment, commanded by Colonel Truman B. Ransom of Vermont. The regiment shipped out for Mexico between May 21st and 28th. The regiment saw action at the battle of Chapultepec, where Colonel Ransom was killed on September 13th. On 19 May 1847 Brigadier General Franklin Pierce stopped briefly at Fort Adams on his way to Mexico. Pierce departed Fort Adams on the 28th, along with the last detachment of the 9th U.S. Infantry, and served with distinction in Mexico. He was elected president of the United States in 1852 and served from 1853 until 1857. Construction of the fort continued during this period. The most significant improvement was the completion of the redoubt about 1/4 mile south of the main fort. The construction of the redoubt was mostly completed under the supervision of 1st Lieutenant Isaac Ingalls Stevens who would rise to the rank of Brigadier General in the U.S. Civil War and be killed in the battle of Chantilly, Virginia. His son, Hazard Stevens, who was born during his father's posting to Newport, would earn the Medal of Honor and be brevetted to Brigadier General. The redoubt qualifies as a fort in its own right and has a number of sophisticated features including an outer ditch, and inner ditch, reverse fire galleries, interconnecting tunnels, and a unique dual spiral granite staircase. The fort was manned continuously until October 1853 when it was placed in caretaker status until 1857. In 1857 the fort was garrisoned by Company I of the 1st U.S. Artillery under the command of Captain (Bvt. Lieutenant Colonel) John B. Magruder. On 11 Sep 1859 Magruder was host to Major General John E. Wool, commander of the Army's Department of the East, and former President Millard Fillmore when they inspected Fort Adams. 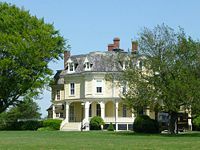 Magruder and his company departed Fort Adams on 31 Oct 1859 and the fort reverted to caretaking status until the U.S. Civil War. The caretaker detachment was commanded by Ordnance Sergeant Mark W. Smith. Ordnance Sergeant Smith was a veteran of both the Seminole and Mexican War and would later serve at Fort Griswold in Groton Connecticut where he died in 1871. 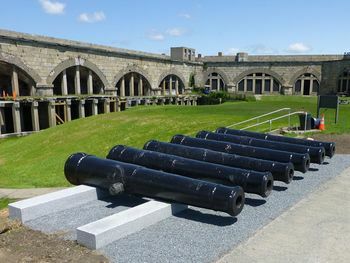 During the U.S. Civil War Fort Adams was rearmed, with new Rodman guns, 10-inch pieces in the casemates and 15-inch guns in open batteries atop the southwest bastion of the crown work. The army later constructed permanent batteries for 10 and 15-inch Rodman guns on the island. On 11 Jan 1861 Lt. Edson and six ordnance men from Watertown Arsenal arrived to activate the Fort. On 9 May 1861, the frigate U.S.S. Constitution ("Old Ironsides") arrived under tow with about 70 midshipmen of the United States Naval Academy on board. The academy was moved from Annapolis, Maryland for fear of Maryland being invaded by the Confederates. This arrangement lasted until 21 Sep 1861 when the academy was moved to Newport. From Oct 1862 until the end of the war, Fort Adams served as the headquarters of the 15th U.S. Infantry Regiment of the Regular Army, under the command of Colonel Oliver L. Shepherd. Fort Adams was used primarily as a recruit depot. From Oct 1862 to May 1863 the fort was commanded by Lieutenant Colonel John P. Sanderson of the 15th U.S. Infantry. He was succeeded by Colonel Oliver L. Shepherd. Colonel Shepherd's command was interrupted by the brief tenure of Brigadier General Robert Anderson in 1863. From Aug 19th to Oct 26th of 1863 Fort Adams was under the command of Brigadier General Robert Anderson. Anderson was a living legend for his stand at Fort Sumter at the beginning of the war but was in poor health, attributed to the stress he suffered as a result of surrendering Fort Sumter, which prevented him from active service at the front. Anderson was assigned to Fort Adams in hopes that by being in a pleasant and healthy environment he would recover from his ailments. In late October Anderson retired from the Army at his own request. He died in Nice, France in 1871. He is buried in the West Point Cemetery. Fort Adams returned to its primary function as a major coastal artillery fort after the U.S. Civil War. Periodically the garrison would be rotated as the two primary assignments for an artillery unit of the time were garrisoning coastal fortifications and defending the western frontier. 1870s Commanding Officer Quarters known as the "Eisenhower House"
In the 1870s and 1880s, additional officer housing was constructed on officer row including commanding officer quarters, adjutants quarters and five officers duplex quarters. Several NCO quarters were built but the majority of NCO quarters were built into the 1825 old fort casemates. Four barracks were constructed that could house up to 623 enlisted men. Construction on the first of six concrete Endicott Period gun batteries on Fort Adams began in 1896. The first two were 12" mortar batteries, Battery Greene and Battery Edgerton and they were both accepted for service in May 1898 during the Spanish-American War. Battery Reilly (10") and Battery Talbot (4.72") followed in 1899. Battery Bankhead (2) (6") and Battery Belton (3") were accepted for service on the same day, 31 Jul 1907. All of the guns in these batteries were breech loaded and rifled. None of the batteries was located within the walls of the old Fort Adams and most were aligned along the water on the west side of the post. Only the mortar batteries were set back from the water's edge. Post construction to support the new batteries included a post hospital (1900), an administration building (1901), a guard house (1903), a power house (1901) and a post exchange (1906). When the United States entered the World War I in August of 1917 twenty companies of Coast Artillery troops from the Rhode Island National Guard were activated and helped reinforce Regular army troops at Fort Adams and other Rhode Island coastal fortifications. Fort Adams did not see action during the war but it served as a headquarters for the coast defenses in Rhode Island as well as a training facility and as a depot for units departing for service in France. On 11 Nov 1918 the armistice ending the World War I was signed. National Guard units activated for the war were demobilized in December and smaller forts in the area deactivated over the next three years. As of 11 Jan 1919, Fort Adams was garrisoned by five coast artillery companies. The period between 1920 and 1935 was marked by significant reductions in Army manpower and budget. The regular army was quickly reduced to an authorized strength of 125,000 men and the Coastal Artillery was reduced to 12,026 men. Of the 12,026 authorized, less than 3,500 men were authorized for all of the fixed U.S. harbor defenses. Sixteen of the harbor defenses were put in caretaker status and the remainder were reduced enough so that many of them were effectively in caretaker status. Fort Adams was not immune to the cuts and while the post remained active the armament was put in caretaker status. Special emphasis was put on rebuilding the National Guard and providing yearly training opportunities for all the guard units. The Civilian Conservation Corps (CCC) came to the post in the mid-1930s for construction and restoration of facilities and in 1935 a Citizens' Military Training Camps (CMTC) was set up on the southwest corner of the post near Battery Reilly. CMTC camps allowed civilians to do basic military training without incurring a service obligation and provided a commissioning program. The CMTC section was mostly a tent camp area but had a mess hall that could feed 500 men and permanent latrines. In 1939 the post had a listed capacity of 20 officers, 29 NCOs and 623 enlisted personnel. At the beginning of World War II, the only active Endicott Period battery on Fort Adams was Battery Greene-Edgerton. This 12 " mortar battery was obsolete at the beginning of the war and was scrapped in the fall of 1942. The harbor defense was taken up by coastal forts on other reservations further out in the harbor. The only guns remaining on Fort Adams were three, 3" antiaircraft guns. A 90mm AMTB battery and a 155mm mobile battery were located at Brenton Point. Fort Adams expanded, like most coastal forts, just prior to the start of World War II. The Army built a number of temporary WWII style buildings on the post before June 1941, in anticipation of large numbers of draftees. These new buildings included ten standard WWII barracks, each housing 63 men. Along with the barracks came the mess halls, admin buildings, day rooms and recreational facilities. Post capacity increased to 60 officers, 33 NCOs, and 1284 enlisted men. Fort Adams was closed as a coast defense installation in June of 1950 - the same month as the outbreak of the Korean War. It was turned over to the Navy which used the old fortification as a storage facility and quarters for use by senior officers stationed at the Naval War College. In the late 1950's the Navy built additional officers quarters in the area and the development is now known as Brenton Village. 1868-04-29 1868-07-28  Maj. Gibson, Horatio Gates 1347 Slight overlap in command with the next is per Cullum's Register. 1868-07-27 1869-02 Col. Sherman, Thomas West 859 Slight overlap in command with the preceding is per Cullum's Register. 1889-05-27 1892-06-18 Col. Mendenhall, John 1513 Died at Fort Adams a few days after relinquishing command of the post. 1896-12-01 1898-05-11 Col. Pennington, Alexander Cummings McWhorten 1864 While commanding post, he was promoted to Brigadier General in the Volunteers, May 4, 1898. 1899-06-12 1903-01-05 Col. Hasbrouck, Henry Cornelius 1908 While commanding post, he was promoted to Brigadier General, Dec. 1, 1902. 1906-10 1909-11-11 Col. Howe, Walter 2200 Died a few days after relinquishing command of the post. 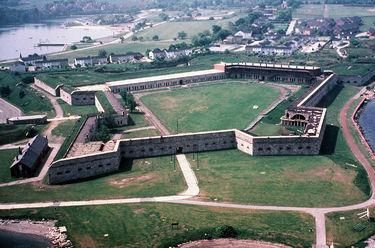 In May 1965 the fortification complex and the adjacent waterfront property was given by the Navy to the state of Rhode Island for use as a state park. Since that time the fort has been opened for public use and partially restored. Period guns and carriages are on display. Access inside the old fort is by daily guided tours, Mid May thru Columbus Day, every hour on the hour from 10:00 AM to 4:00 PM. Must see fort! Location: Fort Adams State Park, Newport, Aquidneck Island, Newport County, Rhode Island. This page has been accessed 32,251 times. This page was last modified 21:21, 7 January 2019 by John Stanton. Based on work by Bill Thayer.